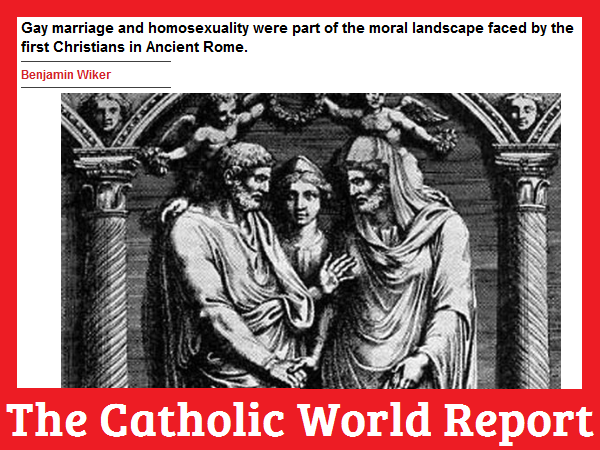 The Catholic World Report has an article dated May 22, 2012 by Benjamin Wiker that is bound to stir up some controversy. Entitled “Gay Marriage—Nothing New Under the Sun,” the article gives some historical context for marriage equality. I highly recommend reading the article, as it’s another tool in our arsenal. Benjamin Wiker, Ph.D. has published nine books, with another coming out this fall with Scott Hahn, Politicizing the Bible: The Roots of Historical Criticism and the Secularization of Scripture 1300-1700. He is currently working on a book on the Church and the secular state. His website is www.benjaminwiker.com.